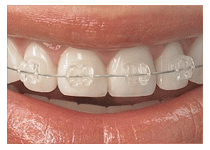 These are the type of braces you most commonly see people wearing. 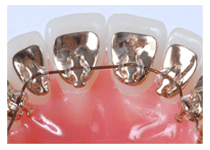 Small metal attachments or brackets are bonded to the front of the teeth and are joined together with fine metal wires. They are affectionately called train-tracks. These braces are the most sophisticated available and may be the only way that a severe problem can be corrected by the orthodontist. These are a form of fixed brace which is bonded to the front of the teeth. 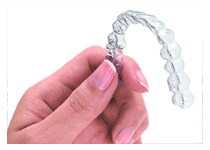 Instead of the traditional metal attachments, the brackets are made of a tooth colored or clear ceramic material. These braces are not quite as strong as metal ones and are not suitable for every type of correction. Treatment times can sometimes take a little longer with ceramic braces. These braces are worn behind the teeth -on the inside and may be glued to the teeth in the traditional way. They have the advantage of being nearly invisible but can be more challenging to wear (e.g. being an irritant to the tongue). 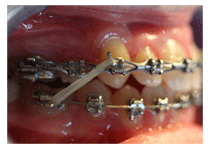 These braces may be appropriate for use in some types of orthodontic corrections. This type of proprietory treatment involves wearing a series of nearly invisible plastic aligners on the teeth. Teeth are moved in a series of short steps with each aligner being worn 23 hours per day for 2-3 weeks. Certain types of bite problems are unsuitable for treatment with Invisalign (e.g. very large overbites, jaw problems and severe crowding). With these appliances, patient compliance is essential.